Eric Devin writes an in-depth tactical analysis about the UEFA Champions League match that finished Manchester City 5-3 Monaco. Monaco’s 5-3 loss to Manchester City on Tuesday doesn’t leave the Ligue 1 leaders in an impossible position, but a willingness to kill off the game through substitutions may have left the visitors in better stead ahead of the return leg on March 15. Leonardo Jardim’s opening gambit of using the pacy teenager Kylian Mbappé ahead of regular starter Valere Germain did initially look like paying off, but the adjustments made by his opposite number, Pep Guardiola made the difference in the match. While not a defensive masterclass by either side’s account, the subtle shifts made by the hosts allowed them to gradually take control of the match, their fitness and willingness to track back making the difference, much as it had last year against Paris Saint-Germain. Manchester City have been playing of late with new formation, nominally a 4-1-4-1. It was introduced against Tottenham in the league at what was a low point for the Citizens. Off the back of a 4-0 hammering by Everton, little was expected against Mauricio Pochettino’s team; Ilkay Gundogan was injured, Fernandinho was suspended, and Fernando was only fit enough to make the squad, but not to start. Left with little choice, Guardiola deployed Yaya Touré on his own in defensive midfield. Given the former Barcelona’s attacking proclivities, the move seemed nigh on suicidal, but ably assisted by David Silva’s tracking back and the fullbacks cutting inside, the formation has worked to a tee. The initial gambit is shown in practice on the pitch, with Silva and De Bruyne marking Fabinho and Bakayoko while Touré has a freer role. Sané and Sterling provide the width in attack, with Sagna and Fernandinho, playing as a nominal left back, tuck inside ahead of the center backs. As Touré drops back, he can thus theoretically become a third central defender, while also being the key conduit in starting counterattacks, which are the aim of this formation; the pace and movement of the front three is brought into focus, but with Silva and De Bruyne, there is a great deal of positional flexibility (note how close the average positions of Silva, De Bruyne and Aguero are to each other), which makes it easy to play on the counterattack. Possession football, normally associated with Pep Guardiola’s sides, is still at the core of this formation, but the manager has also sought to get the best out of the versatility of De Bruyne and the pace of Sané and Sterling. Much of the doubts that initially surrounded this system stemmed from Spurs’ intense pressing and concomitant attempts to play counterattacking football. When City met Spurs, the result was a 2-2 draw, and there followed some suggestion that perhaps Mauricio Pochettino’s side had been a bit lucky, thereby offering validation of what had seemed a very risky tactical approach. For their part, Monaco offer much of the same, with youngster Kylian Mbappé perhaps included as much for his recovery pace as his ability to be an outlet on the counter. While Monaco normally line up in a 4-4-2, the inclusion of Mbappé meant that the team actually functioned as a 4-2-3-1. In the first image, we see that in action; Mbappé is essentially a one-man press (yellow arrow), while the less-mobile Falcao sits deeper, putting pressure not on the center backs but on Touré. Bernardo Silva and Lemar sit a bit deeper, though, granting Sagna and Fernandinho quite a bit of space. However, as the next image shows, playing more of a 4-4-2 might have been more effective. Here, Silva joins Mbappé in applying pressure to City’s defense (yellow arrows), forcing Otamendi into hacking the ball clear rather than building play through controlled passing. 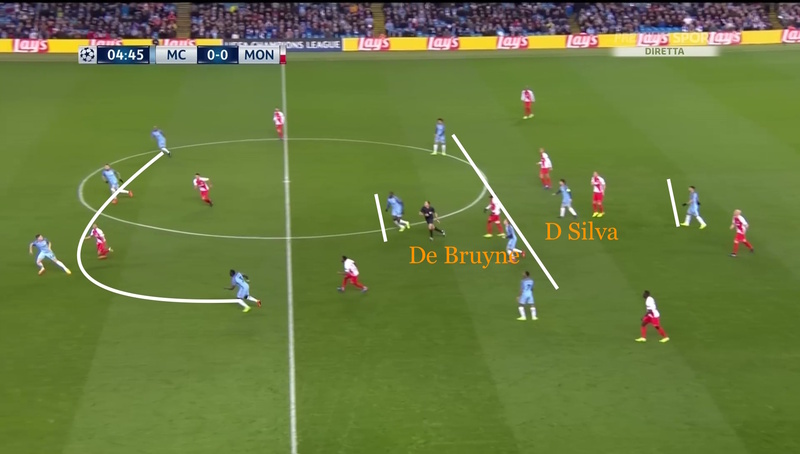 This two-man press also has the knock-on effect of forcing David Silva deep to receive the ball, thereby diminishing his influence in attack. The little playmaker was influential in running the channels against Paris Saint-Germain in the quarterfinals a year ago, but that was in a wide role, and this more central role called for a more nuanced approach and Silva struggled initially to comprehend his place in the system. It wasn’t long, however, before a subtle shift emerged for City. Again, in this first image, with Lemar and Silva playing off of them, the two fullbacks were able to come forward and tuck inside(yellow arows), essentially becoming a de facto defensive midfield ahead of a back three (white lines). This allowed the under-pressure centre backs (note that Touré has dropped between Stones and Otamendi) an extra outlet for a pass out of the back without the danger of losing possession in wide areas, thereby playing into Monaco’s hands. It also, by placing extra men in defensive midfield, allowed De Bruyne and David Silva to push further up the pitch, almost playing as the attacking answer to a double pivot with fewer defensive responsibilities. The second image shows how this system, effectively a 3-2-2-3 (blue lines) also works as a platform for playing on the counter. Here, Sterling has come centrally, switching places with De Bruyne (yellow arrows) (that positional flexibility again), while Sané hugs the touchline on the opposite flank. 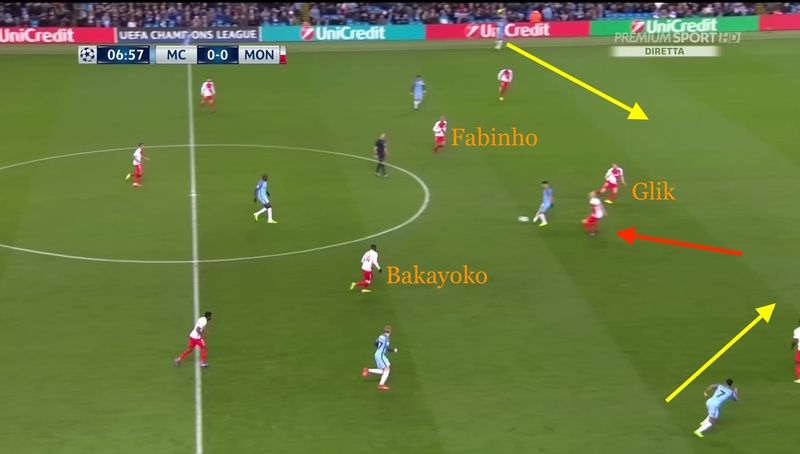 With Monaco’s central midfielders bypassed (note Fabinho and Bakayoko trailing the play), City have a 5-on-4 break on, and both wingers, Sané and De Bruyne, have acres of space to run into (red arrows), either from a through ball or a long pass over the top. Monaco’s back line (white line) has stayed very narrow, perhaps overly reliant on Bakayoko and Fabinho peeling wide to provide defensive support, but the two midfielders have already been bypassed, even as Bernardo Silva puts pressure on his namesake. Thus, City, with a subtle wrinkle to their formation are thus able to torture Monaco on the counter. While some had questioned Sergio Aguero’s motivations and perhaps even his future with City after the Argentine was dropped following the arrival of Gabriel Jesus, he showed the benefit of having a player who can not only score but play with positional intelligence. In the first image, the striker has unselfishly dropped to receive the ball from Touré. 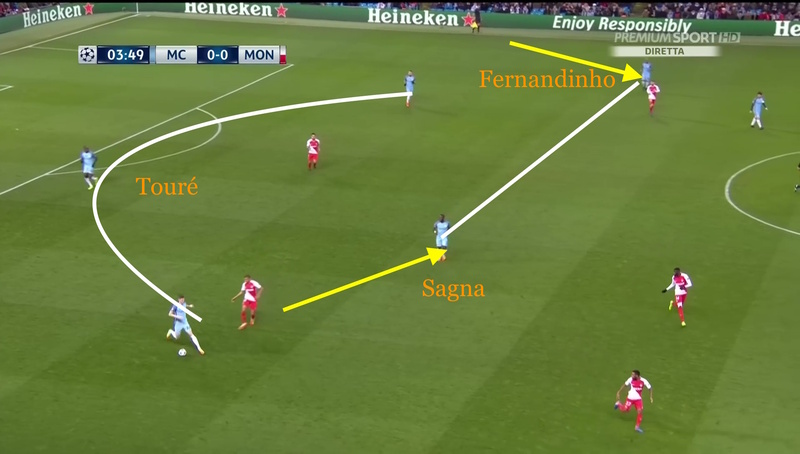 The Ivorian’s pass has split Monaco’s central midfielders, and as both struggle to recover their position and press the little Argentine, Raggi (red arrow) comes forward from central defense to press as well. 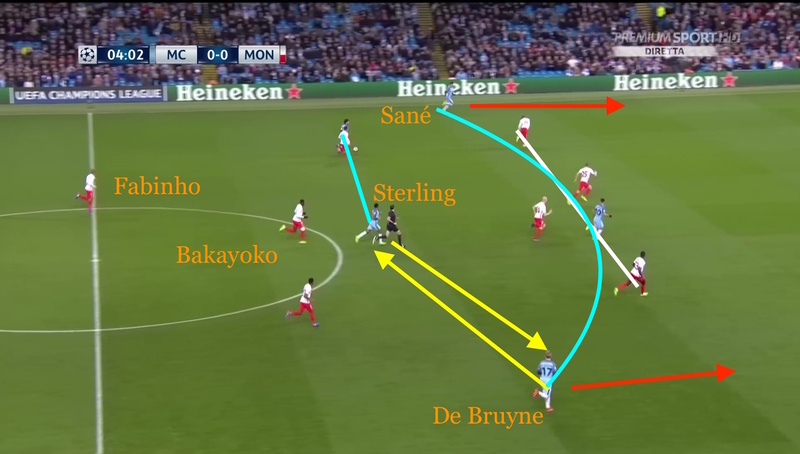 However, with Glik so close to him, gaps immediately show for Sterling and Sané (yellow arrows); the wingers can be played in with a reverse ball from Aguero, or from a ball over the top from one of David Silva or De Bruyne if Aguero wants to re-set play. This build-up, though is made possible by Monaco’s pressing game, so intense in the match’s early stages, starting to drop ever so slightly. In the second image, Stones has the ball at his feet and is about to pick out Touré, who is in a decent amount of space in the centre circle. City’s wide players, cognizant of Stones’ range of passing, have made themselves available in the event the young center back decides to go long, but that he has the choice at all is down to Monaco’s formation, which is evincing what could be termed false pressing. They clearly (white lines) present themselves as a 4-2-4, which should offer more than enough to press City’s back three, even without Falcao’s involvement, but none of them offer more than token pressure, presenting the hosts with a short pitch and an open invitation to play on the counter. 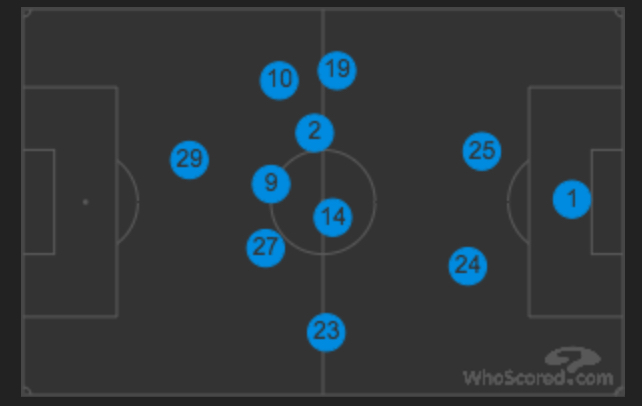 That 4-2-4, even with Mbappé often pressing high to present as a 4-2-3-1, is evident in the first image, which shows Monaco’s average player positions, notably a huge gap between the centre backs and the midfielders. Aguero’s dropping deep gave him plenty of time to occupy that space, thus becoming not only a focal point of the attack, but a facilitator of it as well. 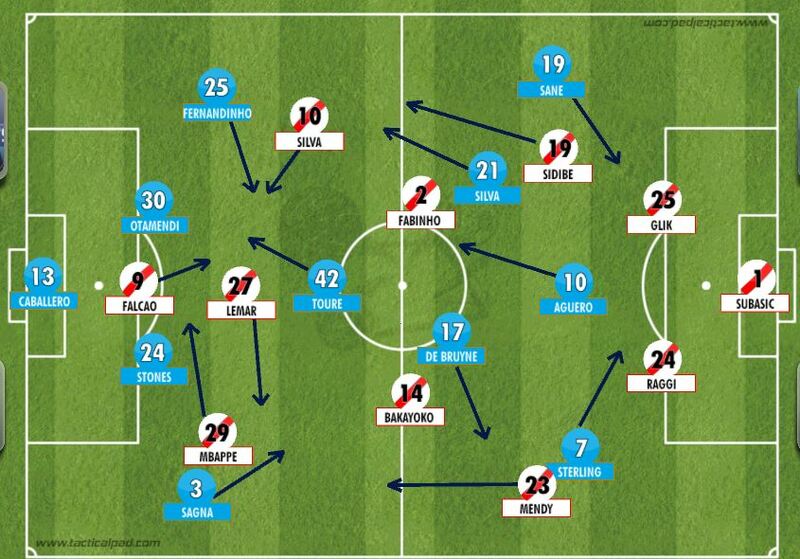 However, it wasn’t only vertically that Monaco struggled with their positioning, as the second image shows. Here, it is not Aguero, but rather David Silva that occupies that space, and his freedom there not a matter of Fabinho and Bakayoko tracking back, but rather being pulled wide. With De Bruyne and Touré coming into central midfield, Bakayoko has gone to chase the Belgian, with Fabinho following to provide cover for the run of Sterling. Thus, the opposite flank is left vacant, even as Bernardo Silva rushes to track back against David Silva. 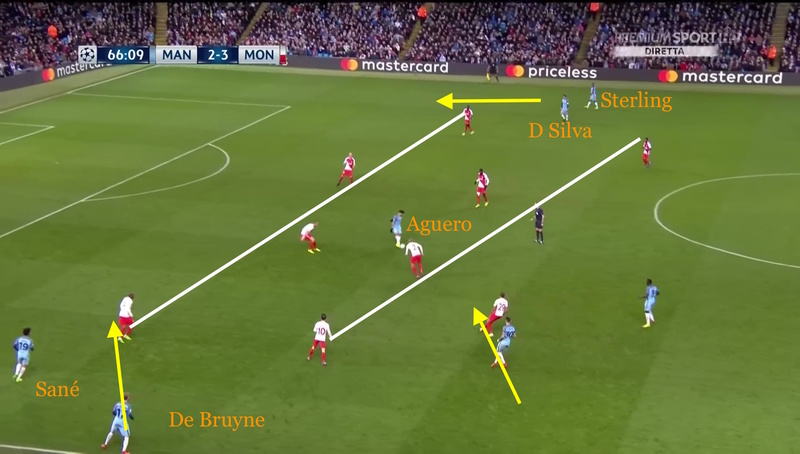 Beyond Silva, Sané has plenty of space beyond Sidibé while Aguero tries to split the centre backs. This particular spell of possession didn’t amount to a chance for the hosts, but with even more ground to cover than usual, City’s movement eventually exhausted Fabinho and Bakayoko, something fully in evidence in the match’s latter stages. That fatigue manifested itself most apparently in terms of Monaco’s ability to press, precipitating a vicious cycle, as these final images show. In the first, City have the ball with Fernandinho in a position approaching midfield, already an improvement from what was shown at the beginning of the match, but in the second, one can almost see the match slipping from Monaco’s grasp. 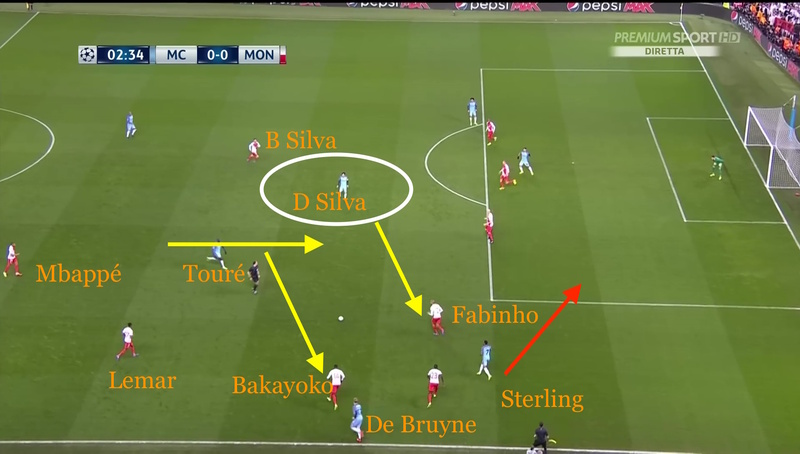 City have doubled down on players cutting in from the wings, as both Silva and De Bruyne have pulled wide (on opposite flanks again). Otamendi (bottom yellow arrow) has strode forward, well into Monaco’s half, and Aguero’s customary hold-up play has the wide players queueing up for a reverse pass. Monaco sit even deeper, essentially playing as a 4-5-1, but with a lack of reinforcements, their ability to get about the pitch is much diminished, calling into question Jardim’s substitution patterns and failure to adjust tactically. There was more to the result than what was in the manager’s purview, of course, with marking at set pieces also problematic. However, Jardim’s insistence at continuing with some of his more exhausted players, particularly Bakayoko and Sidibé, who had both been doubts in the build-up to the match, left his side short-handed and desperate, a fact borne out in the half dozen bookings Monaco received. Whether it was pressure to make a big statement against one of football’s super-rich or simple hubris, Jardim’s failure to make necessary adjustments in tactical and personnel matters cost Monaco if not the tie than certainly the result. Failure to learn from events at the Etihad could well see Monaco’s brilliant European campaign come to an end, leaving observers of French football wondering what could have been.